April 26, 2018, 3:30 p.m.
Americans are not necessarily expecting great things from the planned meeting between President Donald Trump and North Korean leader Kim Jong-un, but they are hopeful, and in the latest Economist/YouGov Poll, the perception that North Korea is an enemy of the United States has fallen to its lowest level since the beginning of the Trump Administration. A majority still see North Korea as an enemy and more than three in four regard it as an at least unfriendly. But the share calling North Korea as enemy is nearly 20 points less than it was last September. 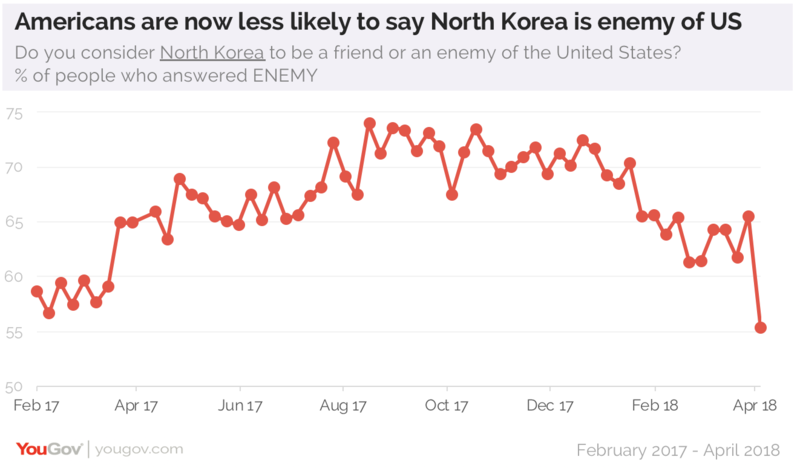 While Republicans continue to be more negative (two in three this week describe North Korea as an enemy), they too have become less overwhelmingly sure in this belief. Last October, 86% of Republicans described North Korea as an enemy. There is overwhelming support for direct negotiations with North Korea: 69% favor US-North Korea negotiations, and just 10% oppose them. 17% of Democrats say they oppose those talks; that is a reversal from last year when Republicans were more likely than Democrats to oppose direct negotiations. Now few Republicans oppose the President negotiating directly with North Korea. By more than four to one, Americans agree that the President should have accepted Kim Jong-un’s invitation. But there are clearly many possible bumps ahead in reaching an agreement that will make a difference in North Korea’s development of nuclear weapons. One is the North Korea leader himself. Only 5% of Americans have a favorable opinion of Kim Jong-un. The US public is divided on whether he is a strong or weak leader; 51% say Kim is a strong leader while 49% disagree (Americans are also divided on President Trump’s leadership – 45% call him a strong leader, while 55% describe him as a weak one). 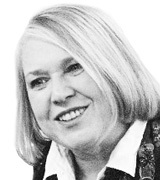 Many are dubious that the meeting will make much of a difference. Just as many think that it will be mainly for show as believe it will be an important step towards real peace between the two countries. Republicans are more hopeful than Democrats that the Republican President’s negotiation with Kim will be an important step forward. The Trump acceptance of Kim’s invitation has made a difference in how Americans evaluate the president’s handling of North Korea. Last December, just a few months after the two leaders had traded insults, half the public disapproved of the President’s handling of North Korea. Now, there is an even division. 41% approve of how the President is handling North Korea, and 42% disapprove. Democrats disapprove; Republicans approve, and independents are narrowly negative. Perceptions of the President’s handling of North Korea are better than the public’s view of his management of foreign policy in general and of his handling of Cuba, where Raul Castro has just stepped down from the Cuban Presidency. Few expect that much will change in Cuba with the transfer of power. But just as Americans favor direct negotiations with North Korea even while many say it will just be for show, Americans want normalization of US relations with Cuba, even while assuming that the change in power there won’t have much of an impact on life in Cuba or US-Cuban relations. Democrats and Republicans alike want normalization, and more. Americans favor US travel to Cuba, and nearly half want to be permitted to buy Cuban goods and allow Americans to send money to non-Communist Party member Cuban citizens.